Last year HBO was constantly playing the Tim Burton Batman movies. So, naturally, my son got into them. While we were watching them he suggested that he wanted to be Batman for Halloween. I said what about a villain, you never see the kids dressing up as them. That is when he said he wanted to dress up in a the Batman Penguin costume and I could not have been happier with his choice. With this costume I did have to get my friend’s mom to make his jacket, ascot and gloves for me. This was because I could not find any in my sons size. But if you have a child who is bigger, it is easy to find them online. So, for the hat he by chance already had from a magician kit. And I actually also used the hat and wig a year before when he was Slash from Guns and Roses. Then we needed his white collar shirt and pants for the costume. Happily, he also already had them! And, in order to create the look of the makeup and fake nose, I was able to get them all at the local party store. So, luckily, that was also super cheap. His costume was the hit of he neighborhood. Everyone, including strangers, stopped him asking if they could take pictures. And they also commented how they never see any kids as the old penguin and they loved it! 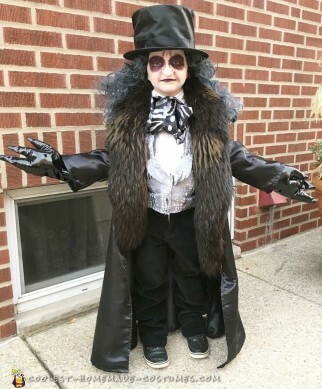 My son was not a fan of the fake nose, but as soon as he realized how much everyone was obsessed with his costume he did not complain once after that! I could not be happier with how the costume came out!